Within the metal-sphere, the genre tag "atmospheric" is more often than not used in conjunction with "black metal". 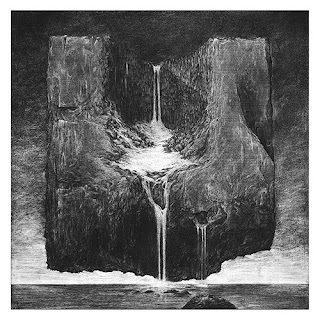 Bands as stylistically different as Alcest and Altar of Plagues have contributed to the expansion of the sub-genre's boundaries. Here to push those boundaries just a bit further, however, are Iceland's Zhrine and their debut album Unortheta. While elements of black metal are evident, Zhrine makes it clear that death metal is their calling card, making Unortheta an aural adventure that is just as devastating as it is enthralling. "Utopian Warfare" opens the album in tremendous fashion. Giving first impressions that the album's soundscape will be serene yet ominous, clean guitar notes gently ring as they continue to gain volume, ultimately leading to a grand outburst of flowing tremolo guitar rhythms, blasting drums, and cavernous growls. Tracks "Spewing Gloom" and "The Syringe Dance" open up the vocal ranges as higher pitched screams are introduced into the mix and the tempo gets a jump. While the back half of Unortheta presents the majority of the album's ambient material, it also contains some of the heaviest riffs (I'm talking about you "Empire"). Zhrine does such a great job of seamlessly weaving these elements together throughout, however, that it does make it difficult to single out tracks that best represent a certain single element. Unortheta is, without question, an album that is enjoyed best by listening to its entirety. But for as many ebbs and flows that the album encompasses, it's also hard to comprehend that tracks rarely surpass the six minute mark on Unortheta. By its very nature, atmospheric music has conditioned us to assume that eight or nine minutes would be the bare minimum that we would expect of a single track. Zhrine proves with this debut that five to six minute songs can pack just as much atmosphere and heaviness as 15+ minute epics. Clocking in at just over five minutes, "World" is the best track to demonstrate this point; as discordant clean guitars lead into an anthemic wall of distortion, accompanied by resonant growls from the depths. All the elements that Zhrine incorporates into its makeup are not necessarily new by any standard, but they are put together in a way that is appealing, to say the least. To throw out a comparison, Zhrine would be what you would get if Ulcerate were less dissonant and technical but just as heavy. The deepest of growls and most thunderous of guitar riffs are offset by quiet tranquil passages that will envelope you ever deeper into the album's flow. It's an album experience that is intoxicating and one that I can't recommend enough.